You know the deal, I present you with something to be reviewed and you tell me why you think it is or isn't worthwhile. Based on a best selling series of books by Jeff Kinney about a kid in the 6th grade. Maybe it's the fact that I don't have children, but I'll be honest with you, until I read about this movie last week, I'd never heard of it. I understand that the books have comics in them, but other than that I know nothing about it. I'm completely open to all opinions on this one. So review away. Oh and if you don't know anything about it either, feel free to make something up. It's what I'd do. In our school system the trend has been towards making elementary school k-5, then 6-8, then 9-12. The logic behind it is simple. Grade 6 (or the 'Snakepit) students are too mature to be around the little ones and the Grade 5s are ready to be top of the pyramid. To make them wait another year causes all kinds of problems. Same with the Grade 8s (or the 'Gulag') Nothing worse than 8th graders when you got 9th graders above them. By that age grade nines needs to be kept down by High School (or the "Colliseum). It's a well oiled system we have to maitain order in the chaos. What does this have to do with the movie you mentioned. Think of that 6th grader as a new prisoner in the 'Gulag'. Until he finds his way or his voice he will be under the influence of everyone else. It's a jungle in those halls. Kill or be killed. I have two kids and still haven't really heard of the books or the movie. I have not seen any trailers for it. I will have to leave this review to the professionals. I was in Costco the other day and saw all of those wimp diary books and they're NY Times BEST SELLERS! I was like, "Um, where have I been?" To be honest, I flipped through them and found 'em a bit boring. Maybe I just picked the wrong pages though. One of the best movies I haven't seen. The poster is almost eye-catching, the actor looks like he'll be able to pull of an oscar-worthy performance as a wimpy kid, and It seems to be following the book very closely. I haven't read it either, but the poster clearly shows a kid. So they're half way there. He looks like he'd write a diary, and his shadow hints at his underlying wimpyness. So how far can it possibly deviate? Clearly this movie is covering all its bases, and even teases us with the added mystery of whether that backpack he's wearing contains the diary or not. I'm utterly intrigued. I worked in a book store over Xmas and these books sell big with the kids. Anything that gets them reading is a good thing. I have to agree with you captain. Especially if it's in book form and not just online. "Better than E.T. Better than Gremlins." Rotten Tomatoes. "A must see," raves Ebert and Robert. "Run, don't walk to this film!" the seattle sun times. Wow. I've never heard of or seen this. When I saw the title, I thought, "Why in the hell would anyone want to see this movie?" 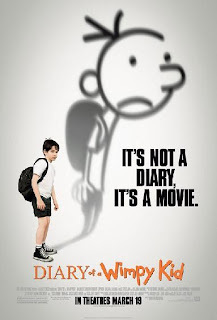 Diary of a Wimpy Kid is the ultimate underdog story and leaves you cheering out of the theaters…LOL! I have no clue. I guess if I were a kid, I might ask mom to take me to see it. They stold my diary, those bastards! That movie and book is about my youthful tribulations. Wait, no...my bad. Napoleon Dynamite was about me. Sorry for the mix-up. This film has Steve Zahn in it. I will watch anything with Steve Zahn in it.... You should too.